"Friendster's cluetrain ticket was misplaced..." for shitcanning Troutgirl for blogging. And just a couple days before, she was up all night making a new feature for Friendster, followed by blogging about what a great team they have. Note her paper from a year ago on Semi-permeable blogging. I caught your post on digital ethics (Aug. 26) and it brought to mind the old Spy Mag spoof "logrolling in our times," when the editors would print a complimentary blurb on the back of one author's book next to that of a book written by the blurber--and you guessed it, he got a nice blurb from the guy he had just blurbed... quid pro quo, I guess. In the case of Jeff Jarvis and Doc Searles, I think a disclaimer before the link would have been in order -- as in, i'm quoted in this piece but I like it a lot, too. In the interest of transparency, a reporter must divulge conflicts of interest, and being quoted in a story that you are pointing to, in my opinion, counts as a conflict of interest. Shouldn't bloggers subscribe to the same standard?? Good point. 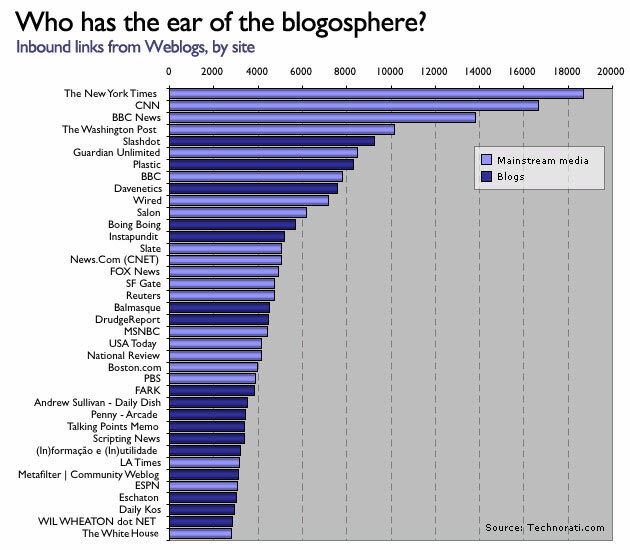 In fact we talked more about the disintermediating effect of blogging on journalism. I think that blogging disintermediates it in many ways, but one new thing I hadn't thought of in quite this way until I said it to Adam was how blogging changes the business relationship between authors and creators, and publishers and editors. Basically, editors and publishers, in their old media format, commodify authors and creators. In the old analog media, you bought Time, and they aggregated the articles.. and while you might know a byline or two, you trusted Time to get the right info, and the authors, with few exceptions, were not promoted, and were not the focus of reader's attention. Publishers and editors had the control and focus. Authors were commodities. In the new online model, with deep linking and bloggers and low transaction costs for publishing, authors are the focus, and editors and big media publishers are both much less necessary, and the control they held is disappearing. In otherwords, in the new model, the commodity becomes editors and traditional publishers. And the focus and attention, that which is linked to, valued and discussed, are authors and creators (partly because they assume the role of publisher and editor). A great author, a great creator, online, will get attention because their creativity and value stand out and originality can't be commodified. This is one of the reasons why digital ethics means author ethics are so important. We want to see where people link, what the relationships are between them, and make our own decisions as readers and conversants about what those author relationships mean, as we take in the work. It's the author who matters, and the author who must decide how and what to show about their own biases and relationships. Because otherwise the online communities will decide for that author. It's so much cleaner if authors and creators give it to us up front. Readers like it and we need it to evaluate trust because authors have become uncommodified. Ben Casnocha wrote a post on the ethics and transparency of linking to people/posts that link back to you favorably. In other words, what appears to be reciprocal appreciation. He mentions the example of Jeff Jarvis' referral to Doc Searls' article on the fate of radio, where Jeff enthusiastically point to Doc. Much of what we're doing here amounts to teamwork. It's not formal, or even conscious in many cases, but it does involve lots of "yes, and..." posting. Sometimes praise is involved. More often it isn't. What matters is that we're not doing it alone. And that we're only beginning to understand what that's about. So I would say it's right to point, for referrals and attribution, and lineage of thought, for community building and transparency. I'd rather know that Doc and Jeff refer to each other explicitly, than have it all happen behind the scenes, as if we all develop every idea in a vacuum, the way old style journalism appears to develop their stories. The people formerly known as the audience still maintain some of the training from big media, where we were led to believe this was true and real. It is not. This is a matter of people getting used to the new online queues, the new behaviors and tools that support them, including both first and second order ones. But as people adjust, I think this ethical question will be worked out, and people will see the transparency and linking for what it is, and appreciate knowing the lineage up front, so they might make their own decisions about the ideas, the texts and the relationships within different communities who collectively collaborate on ideas and plans. But Ernie Miller, who was just on IT Conversations this afternoon for his first show, also just told me that it is going to be a weekly, called: "The Importance of Law and IT." How exciting. Will post the links soon. UPDATE: Ernie sends the link to his show below in the comments. Yes, I work at a blog company and I barely have time to blog. Several things are up: Official news from Donna Wentworth and Fred Von Lohmann at EFF that the JibJab suit has been settled. Congratulations to EFF and the Public Domain. Also, UC Berkeley has made a deal with Real Networks to give students access to Rhapsody for $2 a month. Less than a latte, and certainly less than the $9.95 regular rate. But there are limitations on bandwidth, etc. Undergrads get it free through Oct 31, and grad students pay from the start. Wonder how they figured that one out. Why not give everyone a chance to check it out and then charge. Are grad students more likely to just pay up front? Or too busy to download music in ways the University might get into trouble for because they have so much work, or if UCB didn't regulate it and make the Real offer? John Battelle has organized the most delicious meetup: Web 2.0. It's in SF, Oct 5-7 and he want's input about what might make it better. So iterate in comments!! It's the next step in the conversation, where folks have been meeting now for some time to figure out what matters and why new technologies are important. And of course, an interesting group of folks means the hallways will be outstanding. Mark Cuban is speaking which I'm very excited about because I haven't heard him before. But so are lots of others equally cool. The thing is, in terms of making something that puts us to the next step, gets us thinking, makes us want to go out and innovate, I think the kind of discussion that happened at Bloggercon was radical. What I mean by that is, the people in the room, all say, 200 of them stuffed into some sweaty lawschool classroom at Harvard that really seated 100 (so you know all 200 people felt it was worth it to be there) were up to speed. They didn't need to backtrack to get half the room understanding some subject before they went forward. All the people there spend lots of time reading the discussions online, they know the technologies, they see what's happening and want constructive discussion. But the discussion leader also knew where everyone was at, and where we might be pushed. So we all plowed ahead. And so when the moderator said go, we went: it was a Jay Rosen or a Rebecca McKinnen who led us through an outline, where we, the audience, were the content. They were true moderators. It wasn't about them, but rather their expert eye for ideas and content, to lead us to the next step, see something new, discover something valuable and meaningful. I want that more. I want a room full of smart people, innovative and creative, thinking about the possibilities and the constraints: humanity, technologies both analog and digital, the old and the new, IP laws and politics, metaphors and practical realities. Maybe it's too much to ask, but I believe that we can make these discussions, and I think that John's conference has that possibility. I would love to see him take those smart people he's lined up, get them thinking about how they can use the audience and the room, to make something that takes us somewhere we haven't been before, somewhere unplanned and serindipitious. Use us, put us to work, make us be a part of it. But regardless, I'm still looking forward to the hallways. Because as has been said, theater is soup, it's the people who are art (think Andy Warhol and Lily Tomlin). And I really enjoy the people in my community. by Adam Curry. Hosted by Steve Gillmor. Here: talking about the iPod Platform. We were speaking of re-editing, weren't we? You know, like remix media. 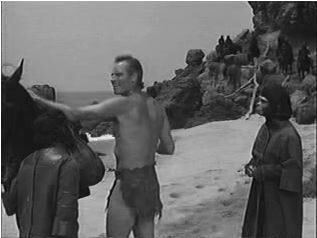 Planet of the Apes as a Twilight Zone Episode. Well done. I just heard that EFF has won its case representing the Jibjab guys. EFF contended that Woodie Gunthrie didn't renew copyright on "This Land is Your Land" back in the day when copyright terms had to be renewed. Documents were filed with courts and letters were written, but now, apparently, according to the copyright rumor mill, EFF and Jibjab have "settled," whatever that means. Apparently they got "everything they wanted" because it turns out nobody ever renewed the copyright on the song. Hopefully EFF will let us know soon for sure. But congratulations on the win for EFF and the commons! By introducing a link to the ATHENS 2004 official Website on your site you are agreeing to comply with the ATHENS 2004 Website General Terms and Conditions. I'll link to them however I please. I hope they are following the traffic to their site, via links and their Technorati cosmos. There appear to be tons of posts from other bloggers writing about their linking policy, which of course means those bloggers may all be in violation as well. Oh my! Are we having an international incident? Do you think they've heard of Diebold? Ooops. I forgot to send the request letter to get permission to link to them. I'm in a pill-ish mood, can you tell? Last night Moveable Type 3.1 debuted at a little Six Apart party in SOMA/SF. Lots of fun folks, good conversations and dry saki fruit drinks (martini style). Lovely party. 3.1 has some cool new features which I'm looking forward to trying out. Discussions ranged from serious coders telling me how with ads in RSS right around the corner, they are working on plugins for all the aggregators to strip the ads out... to blogger/non-techies who were excited about the latest release... to how yummy the food was, and while the space was cool, but they might pass on the art. Various people showed up like the always lovely Jeff Veen and Jeremy Zawodney and Sylvia Paull and Phil Wolfe and Mark Graham and Elise Bauer among others. Oh, and Doug Bowman, the famous and difficult-to-hire-because-he's-so-busy web designer (but he did promise me two weeks in November so I'm going to hold him to it). Afterward, a few folks headed to Lobbycon, which was borne from the "lobby talk" at Blogon.. it was held at the W Hotel.. and maybe 20 people were there. One interesting thing was standing in the lobby for an hour and a half, observing the people who were just in the hotel because they were staying there. Amazing things were happening. Business people were wondering around looking for stuff to do, people were hooking up, a dj was spinning. Humans are fascinating. But I digress. The SixApart and Lobbycon events were both fun. Thanks guys! ps, I almost forgot the shwag: a 32mb key fob with a copy of 3.1... with autographed box from Ben and Mena. Jeff Jarvis, a blogger and president of Advance Internet, gave a different answer: "I have learned to trust the voice and judgment of my fellow citizens." Me too. Smaller bloggers are interesting, because they are making symetrical conversation with each other, sharing information and iterating, collaborating, but big media tends to focus on those that are at the top, because it fits the broadcast model they know. But I'm really interested in the huge conversations going on at the level where bloggers link to each other more symetrically, with say 50 to 250 inbound links each. Those are the ones where others bloggers see interesting ideas, come back for views and expertise that are valuable, time and again. And those are the places where people speak to each other, find connections and answer each others questions to find more truth and discourse. From Technorati data, this chart from OJR shows how sites like Slashdot are in the top 5, for inbound links. Its not about conversation at this level. So why is this important? Blogs use and refer back to mainstream news, but they are also creators of content, act as filters, and have specialized expertise. So the NYT does get lots of links because people are discussing and linking to those articles. But sites like Slashdot are in the top 5 as well. It does resemble broadcast at the top of the chart, but as you move down it, it becomes more conversational and symetric in linking between blogs, and that where the real interesting stuff happens. But the best part is the discussion in the comments that iterates the list of tools and issues that much further. Robert Andrews commented on the Online News Association maillist, and on his blog about registration systems and users/readers frustration with online news sites that each require registration. His thoughts about a common registration system are understandable, but his suggestion that we get something similar to Passport (totally creepy) or Typekey (I have mixed feelings about it; see below) are problematic. Also, Adam Pennenberg has written something for Wired this last week on news site registration, where he admits to committing "..identity theft against my multiple selves..." as he tries to remember his many registration personalities across many news sites, while trying to protect his privacy by registering as people with wildly different demographics. I have to admit, I'm an 85 year old man living in Atlanta on the Washington Post's site, and have many other identities, for the Chicago Tribune, the LATimes, the Miami Herald... and for the NYTimes? I registered eight years ago describing my black lab, now deceased, which is still my login ID. So can totally identify with his story. Maybe I'm paranoid. Although I don't mind the targeted ads at all; in fact I prefer them, because if they are good, I actually want the information. But I hate the collection of my reading habits that are potentially available for some individual, company or government to sift through and put together. What do I have to hide? Nothing. But that's really not the point. People who have nothing to hide, start self-censoring when they know they are tracked and watched. And that corrodes the democracy and the commons. And it leads to totalitarianism. That's not the democracy I signed up for. Identity Commons and Sxip are both working on creating a common user ID that could work across websites, including registrations, blog commenting, for reducing different kinds of spam and email including trackback spam. But there are problems and they are in development, so we have to wait to see what they come up with. But there are lots of security and privacy issues, like who keeps the data (Identity Commons is doing a distributed system) and for each instance where a system like this would be implemented, you have to think about who is using it, and what do trolls or spammers or other baddies have to gain from gaming the system. The controls that keep them in check may also be collecting information on the rest of us that as we learn more about the effects of our own online activites, we feel uncomfortable with and cause us to shift our intellectual consumption. Adam and Robert both suggest a single registration system for logging into publishers sites. It would be great if publishers used a single system, for the convenience, but what happens when someone subpoenas the records of your activities across all those sites? How do you keep people's reading habits private? Sooner or later, it will happen. It's a matter of when and how the information goes out of the hands of the collectors, and into to other's hands. Regarding Typekey, have you used it? I've installed a bunch of Moveable Type 3-series blogs recently, and set up Typekey both for the blog's back end and as a commenter, and find the whole thing disconcerting. First, as the blog owner, I have to connect myself via the blog to Moveable Type, by registering and giving my blog info. Then with that code they've given me on their site, I install it into the configuration on my blog's backend, which the system then syncs with MT back on their end. Then users come along, and when they want to comment, the blog redirects them to create a profile with Typekey if they don't already have one, which makes them able to post on any blog that require Typekey for comments. When a comment is made, the Typekey/MT site inserts an image on the comment located at the blogpost, linking back to the Typekey commenter profile located at the Typekey site. Each time *anyone* looks at the blog, MT gets a signal or ping, because that image has been called up from the Typekey site, as part of the opening of the weblog somewhere else, so MT could collect data about not just the blog and the commenter, but about everyone who visits that blog, somewhere out in blogland. And if you visit several blogs that all use Typekey and have these images planted there, even though you haven't signed up for Typekey as a blog owner or commenter, you can in a way be tracked, your reading habits recorded and strung together. We're committed to providing a service that respects user privacy. Therefore, we will not publish information that you have not chosen to make public, nor will we share your information without your explicit permission. We're not in the business of selling email addresses, and we give users the option to choose whether they'd like to send their email address to the sites which they are commenting on. Who runs TypeKey? Is it safe? TypeKey never shares your password information with site owners, and comment information is only retained on the site you've commented on, not on the TypeKey service. TypeKey is a service for authentication and, >in the case of comment registration, we leave it up to the weblog owners to decide who can post to their own weblogs. Why should I trust Six Apart to not sell my data or share it with unauthorized privacy? Fair enough, they won't share my info if I register, unless they get my permission. But what about my visits to blogs that have their profile image on them? • Six Apart automatically receives and records information on our server logs from your browser, including your IP address, cookie, and the page you request. • Six Apart receives IP addresses from all users because this information is automatically reported by your browser each time you view a web page. Services and publishers that want to create single login registration need to think about the same issues, and make better systems than the current state of Passport or Typekey, so that not just the sharing of a registered user's email is addressed, but also what happens with the collection of reading habit information internally, what they will do when they get subpoenaed for the information they collect, or when the government comes along wanting a copy of the database under the Patriot Act, etc. One of the key tenants of freedom of speech is intellectual freedom, and the freedom to read in private, without fear of surveillance, because if people don't have that, they will self-censor. And it leads to corrosion of the intellectual and democratic health of the system.